This part of the tutorial is pretty simple. 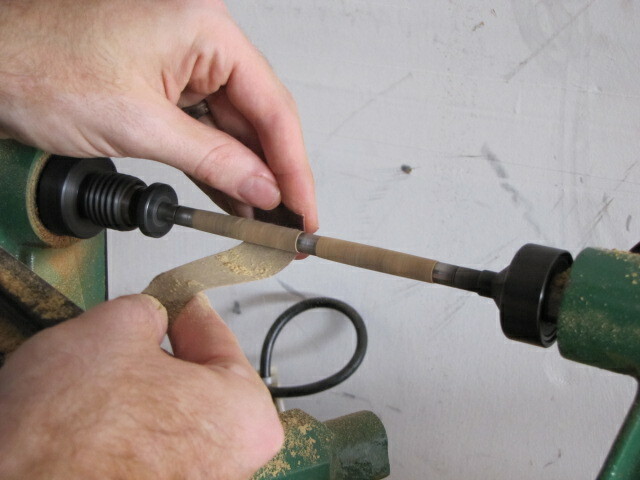 The techniques for sanding a pen aren’t complex at all – it’s just very repetitive. 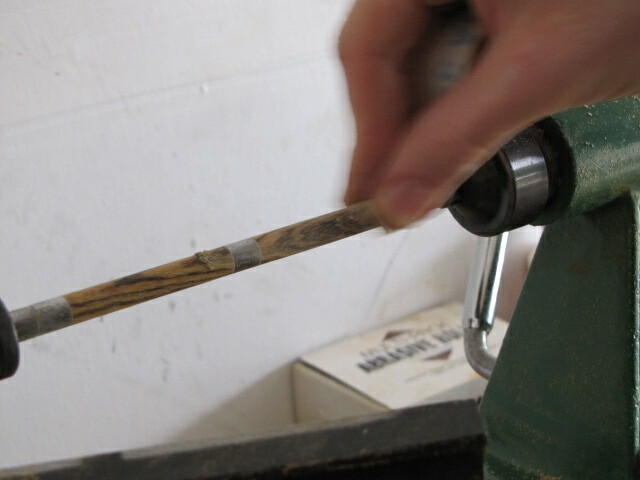 But if you want a beautiful handmade pen when you’re done, sanding is an essential step. It requires patience but you won’t have remotely as perfect of a pen if you burn through this as quickly as possible, so take your time with it and enjoy yourself. 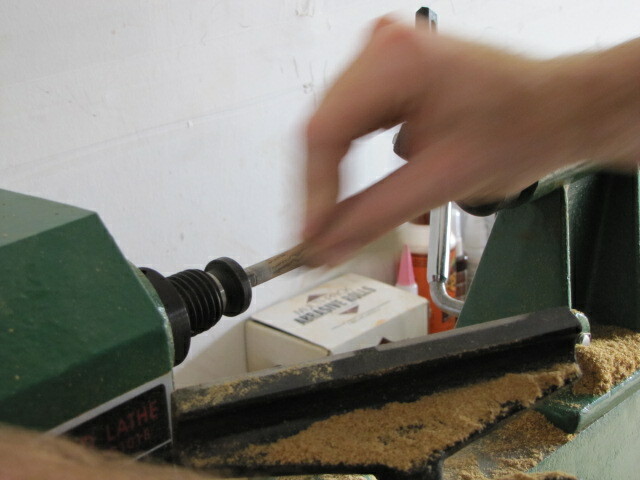 The more time you spend on sanding, the more beautiful your finished pen will be. With all of that being said, let’s get to sanding! 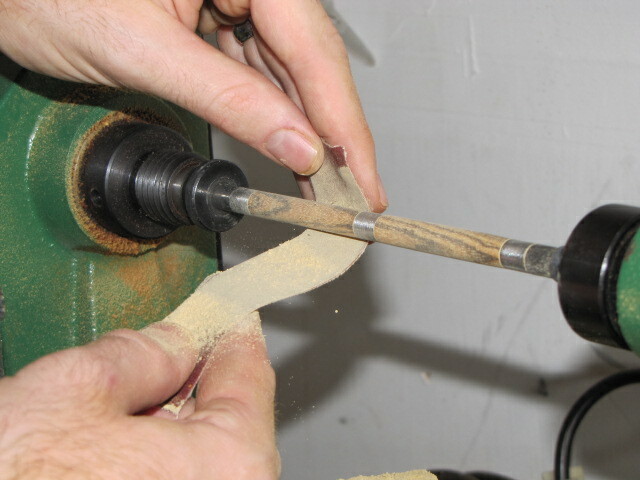 Scroll to the top of this page and click “Step 1” to read about sanding your pen blanks. Remember, in the last section of this tutorial I said that I sand at my second lowest speed, which on my lathe is 1100 RPM. 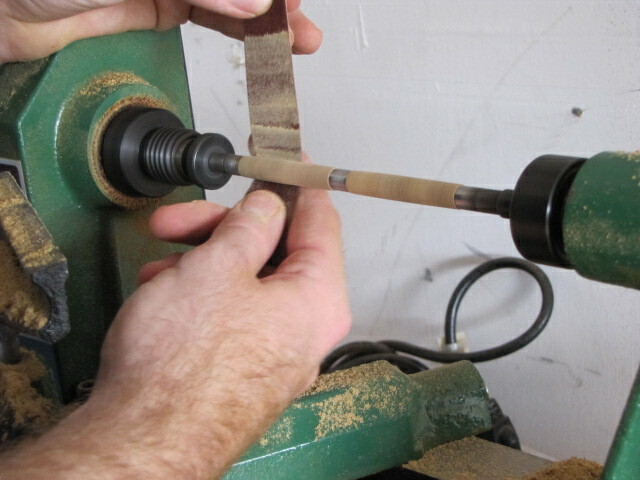 Take a minute to adjust your lathe speed before you start sanding. If you’re not sure how to adjust your variable speed mini-lathe, consult your owner’s manual. 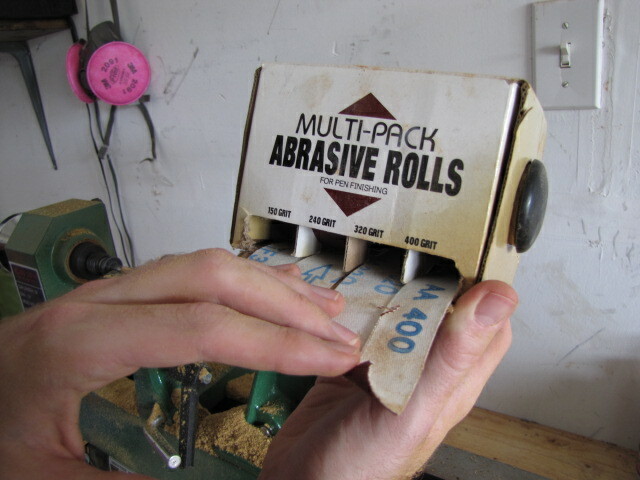 I usually like to use these multipack sandpaper rolls from PSI, which I linked to in the “What You’ll Need” tab. 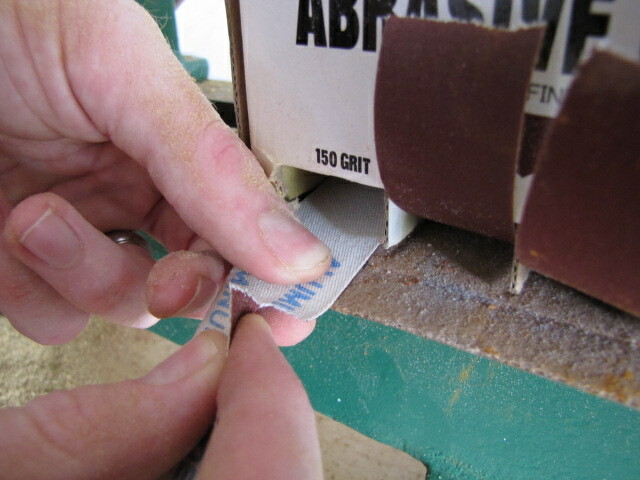 I used to just cut the sandpaper into strips myself, but there is something extremely convenient of having them all nicely compacted, organized, and side-by-side for quick and easy access when sanding. We’ll start with the heaviest grit sandpaper – 150. 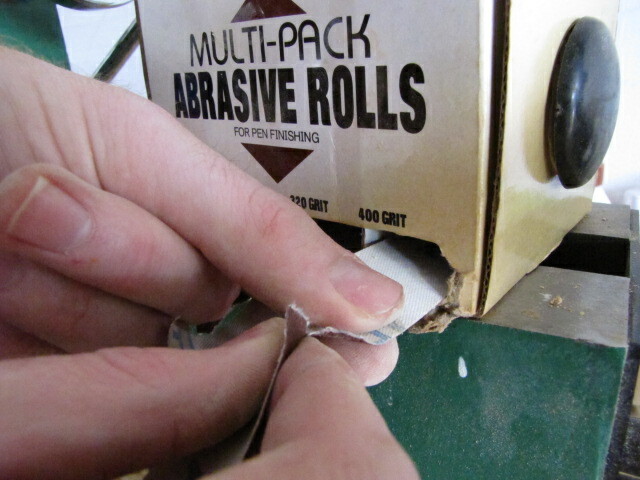 Just pull out about a 5-7 inch strip and tear it off of the roll. 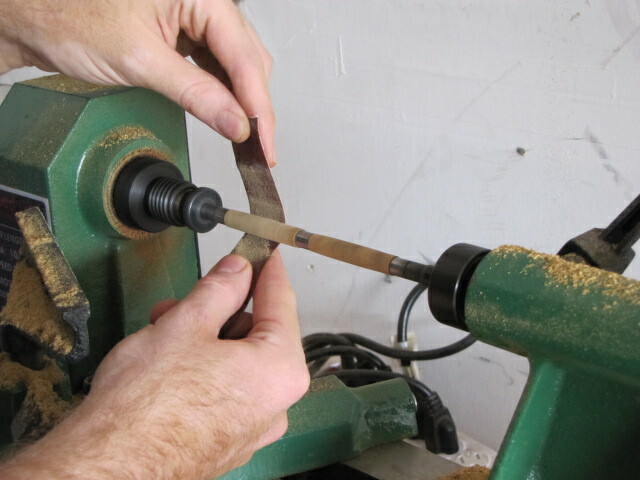 As I said before, there’s nothing really fancy about sanding your pen blanks – just a lot of repetition. Unlock your tool rest and pull it back and to the left as far as you can. 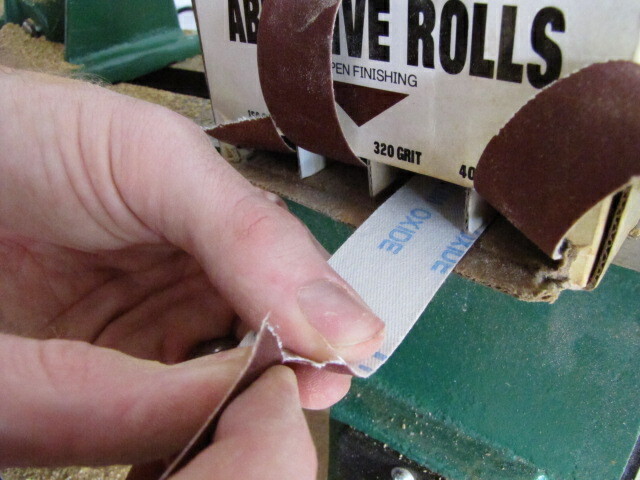 Typically you’ll hold your strip of sandpaper on both ends, and move it up and down as you move left to right across your pen blank. 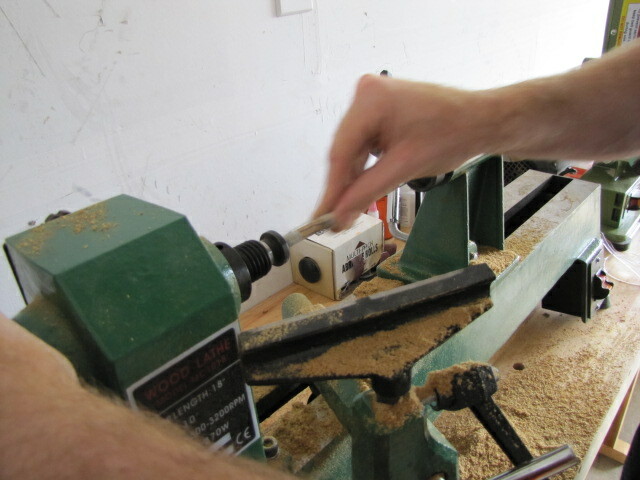 I usually sand each blank 2-3 minutes with the 150 grit. Just keep moving back and forth, up and down for a couple of minutes. 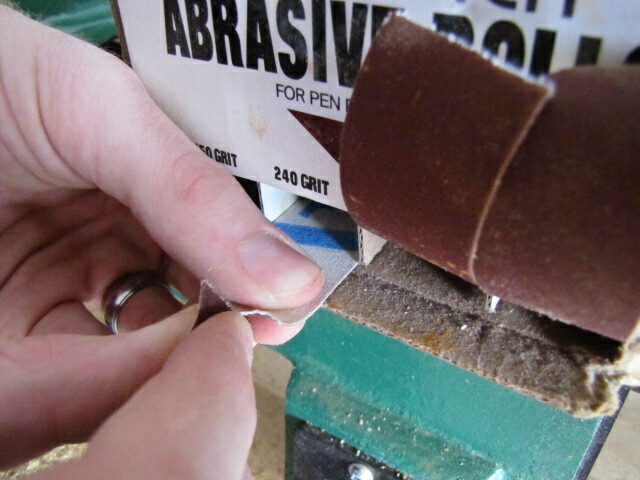 Don’t apply much pressure here – you don’t want to dig scratches into your blank with this heavy grit sandpaper. 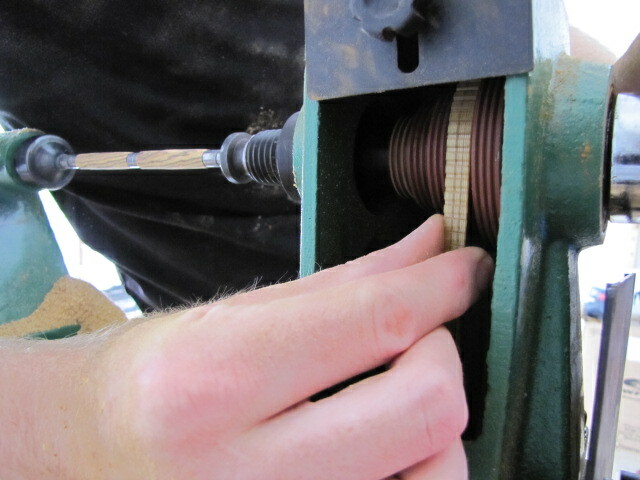 Just like the later stages of turning, let the sandpaper do the work and simply keep it moving. This is a good place to get the kids involved if you want them to experience pitching in, just make sure they don’t have any loose fitting clothing or jewelry on that might get caught in the lathe. See how we’re almost down to the bushings but not quite there yet? That’s when it’s time to move onto the next grit. See how the blanks are noticeably scratched by the heavy grit? 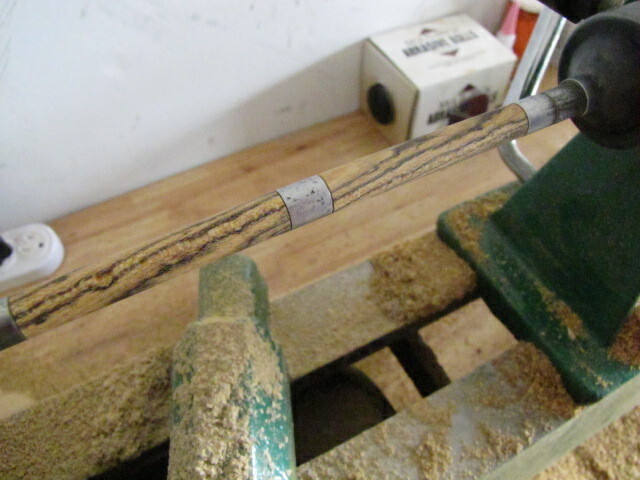 This is due to the fact that we’re using heavy grit sandpaper AND sanding across the grain, which we will start addressing as we get into the finer grits. 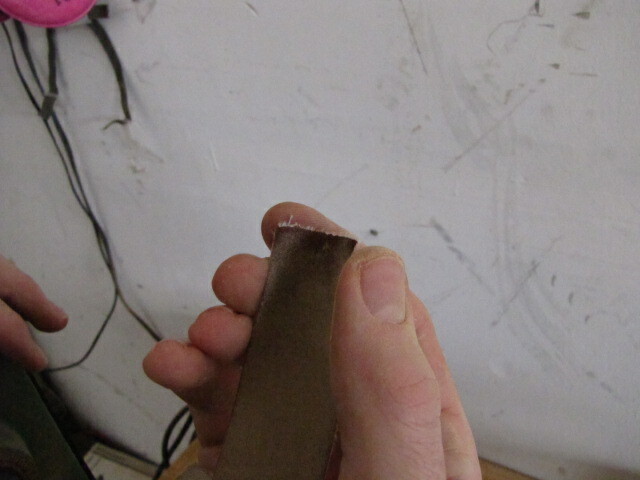 For now, just repeat the exact same thing with the 240 grit sandpaper. 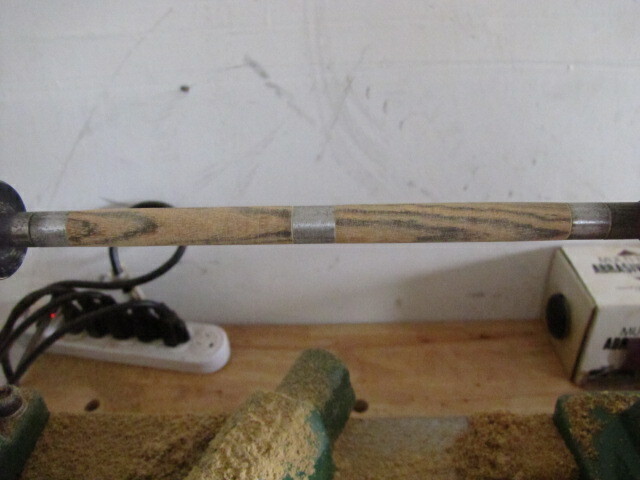 You can see in that picture that I’ve taken my blanks all of the way down to the bushings. That means they’ll fit the pen kit perfectly, right? Unfortunately it’s not quite that simple. If you want a pen that matches up perfectly flush with all of your pen kit accessories after final assembly, it takes a little more effort. 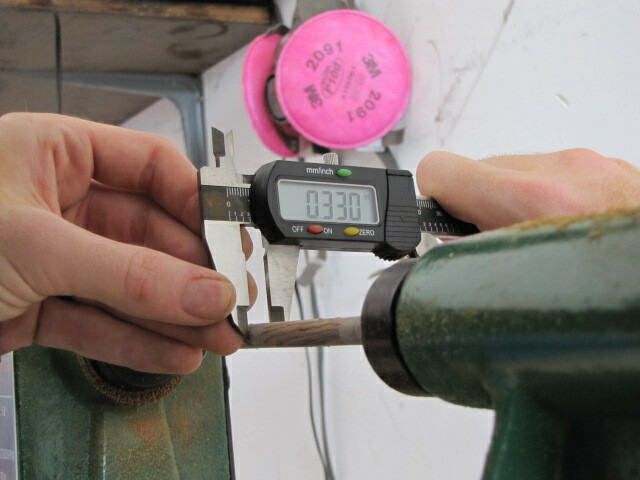 Scroll to the top of this page and click “Step 2” to read about measuring the ends of your blanks to ensure a perfect fit after assembly. If you’re okay with skipping over the fine details and not having perfectly flush edges once your pen is assembled, you can skip this next step. 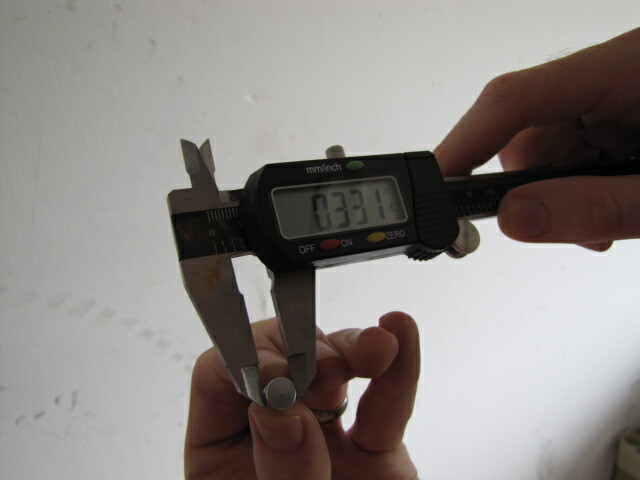 However, if you want the highest quality, most professionally turned pen possible you’re going to need to break out your digital caliper. 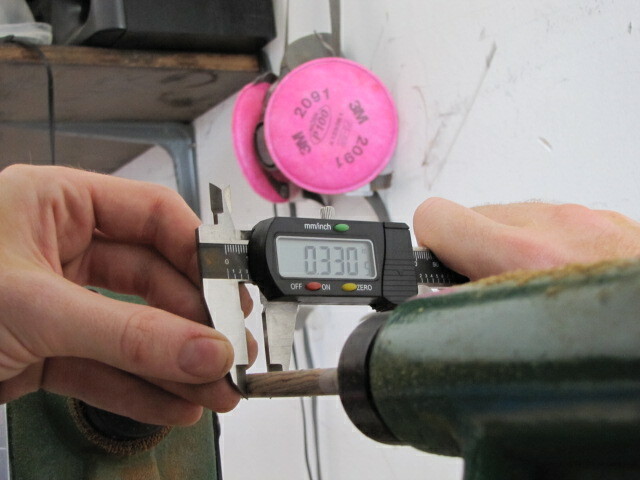 Now that our pen blanks are sanded all of the way down to the bushings, it’s time to start paying attention to precise measurements. 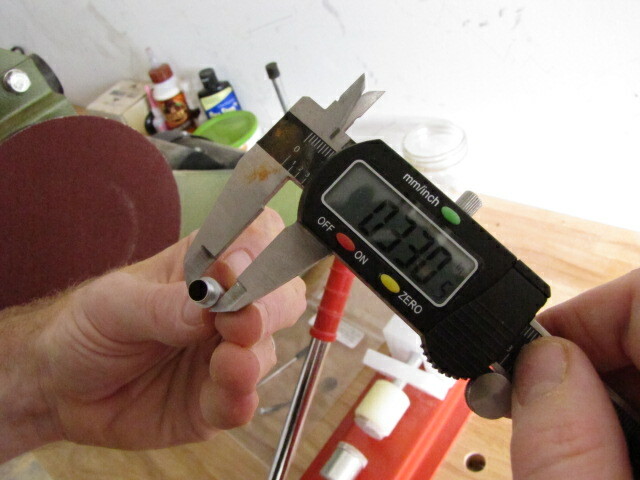 To do this, take your digital caliper and measure the following accessories in your pen kit: the pen tip, the center band, and the cap that you’ll use to press the clip into the finished blank. Take note of each of these measurements. 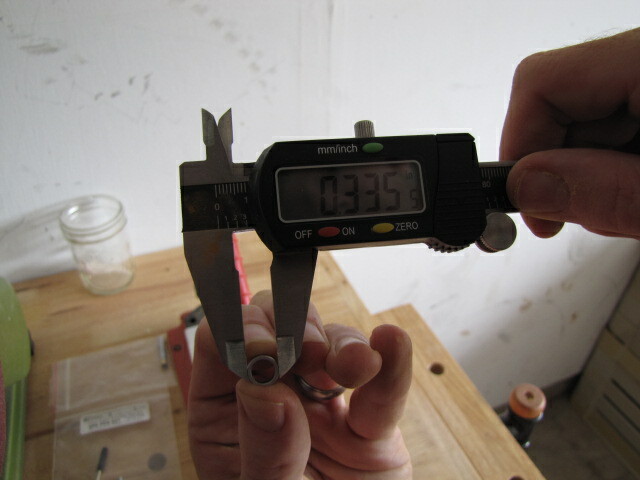 In my experience, it’s pretty easy to feel anything that’s more than .001″ off. That means I need to get somewhere in between .330 and .332 for the end of my cap, within .334 and .336 for both sides of my center band, and .329 and .331 for the tip of my pen. 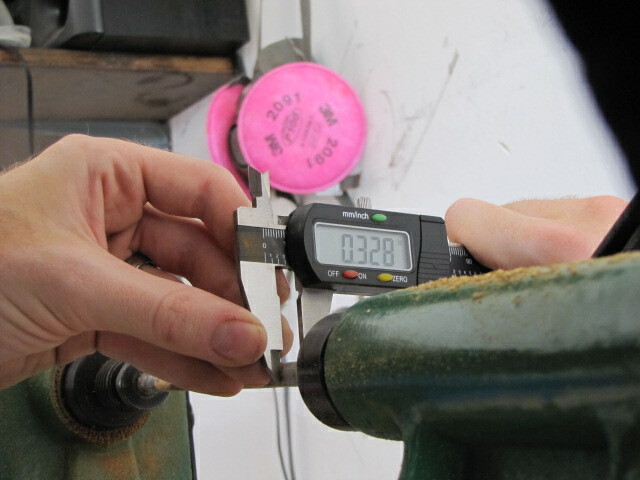 So now that we know the measurements of each of our accessories, we’ll sand one more level and measure our blanks. 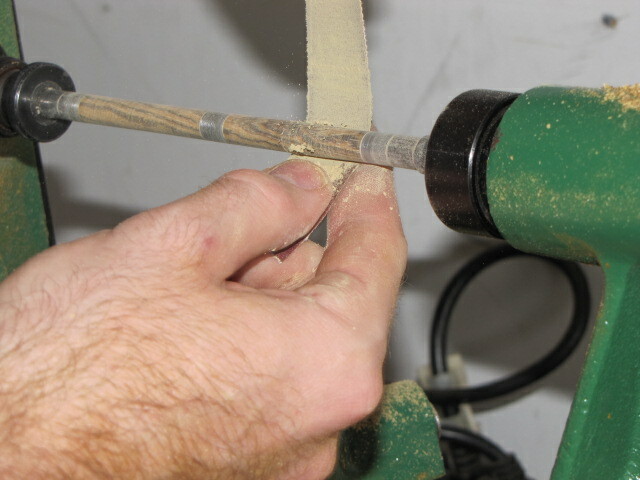 Continue with sanding just like the last two grits, but only spend 1-2 minutes working each blank. 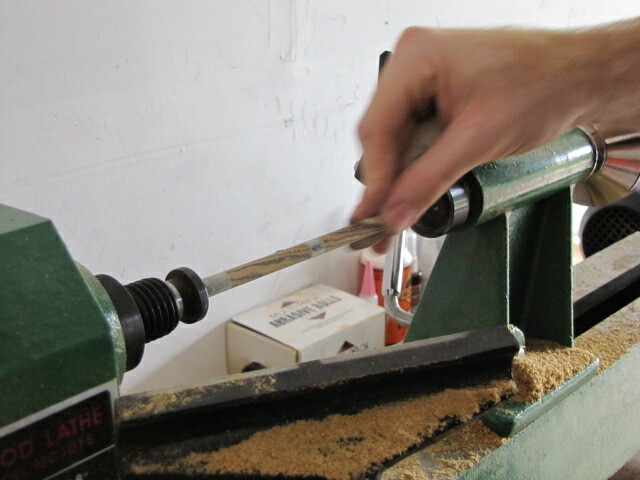 With the lathe off and without turning your blank at all, sand back and forth over the blank quickly about 15 times (15 sets of back and forth motion). 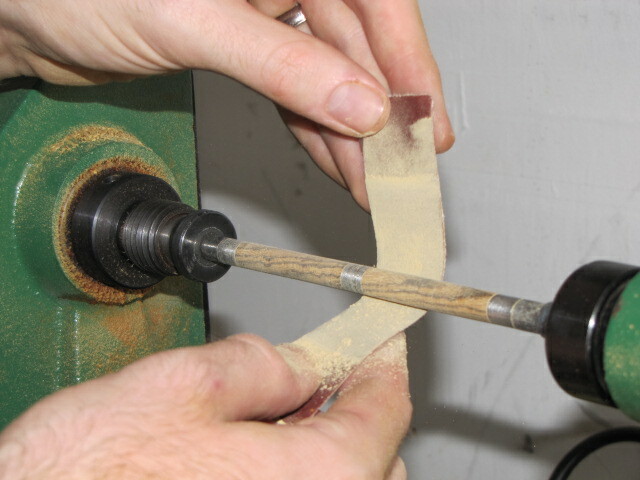 After you’ve sanded the first segment, lift the sandpaper from the pen blank, turn the headstock handwheel about 1/4 of a turn, re-apply your sandpaper to the surface of the blank, and quickly sand back and forth about 15 times again. 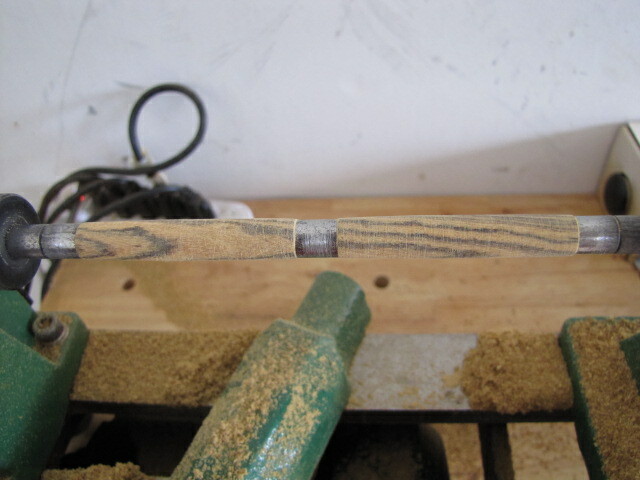 Repeat this step until you have sanded every section of the blank. See how much clearer the blank on the left is? 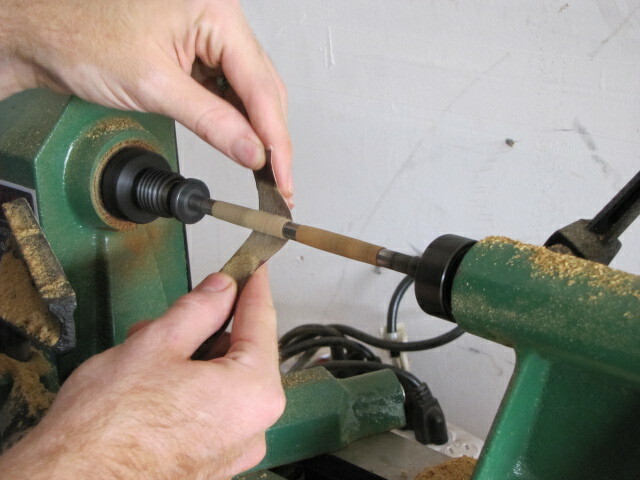 Repeat the steps above for the other blank to remove the cross-grain scratches as well. This whole process should only take you 30-45 seconds per blank once you’ve got the hang of it. We’ll turn the lathe off and do this for every level of sanding from now until we are done sanding, including when we are applying our CA finish. I’ll keep mentioning it every step of the way, just be aware that this will be repeated at every level of sanding. 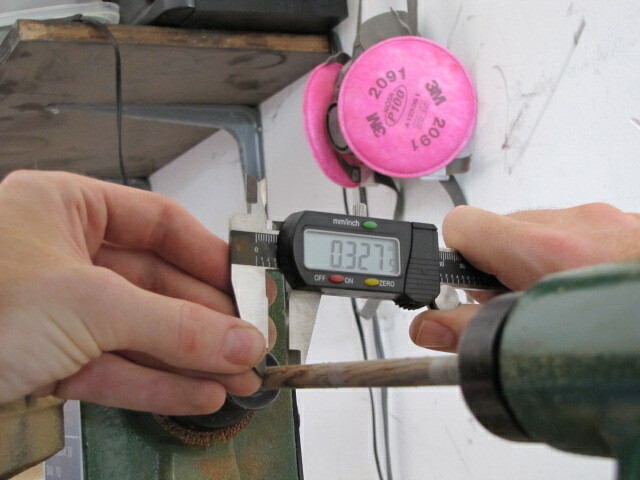 Now we’ll go ahead and measure the ends of both of our pen blanks to make sure we’re in the neighborhood of where we should be when it comes time for final assembly. OH NO! My measurements for my pen kit accessories were .331, .335, and .330! I’ve ruined the blanks and I have to start over! Actually, I have nothing to worry about. Remember, I’m putting a CA finish on this pen so I need to take my blanks .005-.010 smaller than my pen kit accessories to make room for the extra thickness that my CA finish will add to the blanks. I’m right where I need to be. Note: If you’re not putting a CA finish on your blanks then DO NOT take them past the measurements you got from your pen kit accessories. Keep them within the .001 either direction that I mentioned earlier. Now that I know I’m safe, I’ll do my last level of sanding at 400 grit. Again, this is just like the last three levels of sanding but only spend 45 seconds to a minute on each blank before turning it off and sanding to remove cross-grain scratches. 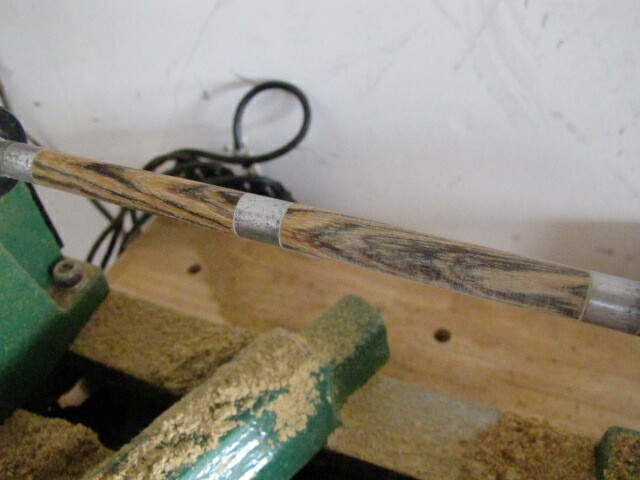 You can continue up to 600 grit if you’d like, but since we’re going to put a CA finish on this pen (which has a great deal of fine grit sanding), 400 grit is more than good enough in my experience. 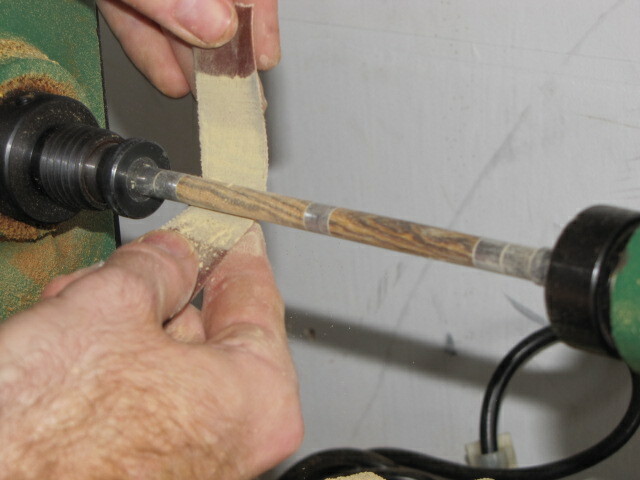 We just need to clean our blanks really quickly and then move along to putting on our finish! 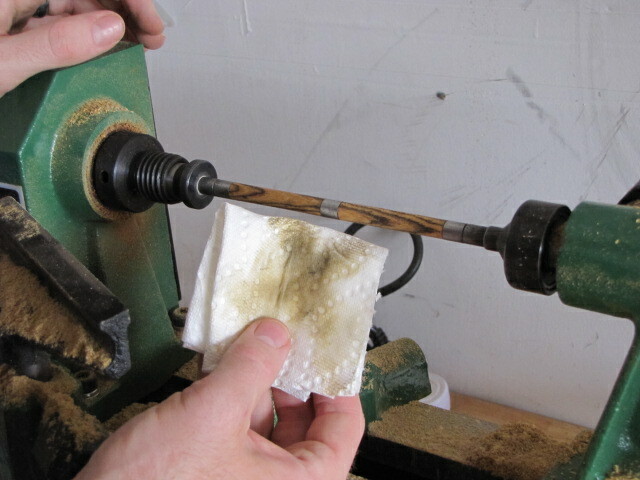 Scroll to the top of this page and click “Step 3” to read about cleaning your pen blanks. You don’t want tiny specs of sawdust permanently stuck in your finished pen, so we’ll give it a quick cleaning before we start our CA finish. 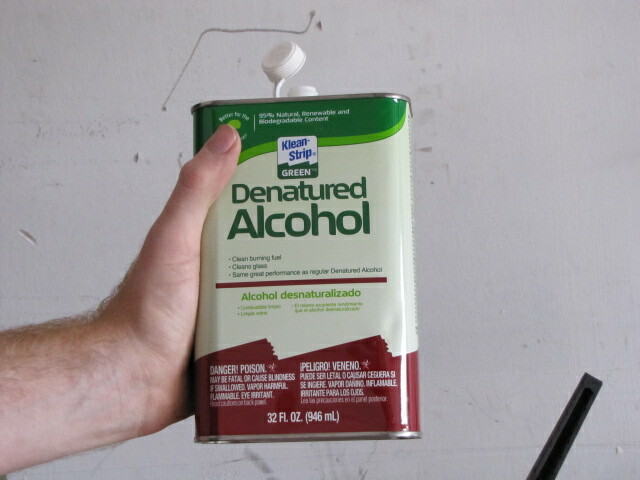 This is done using denatured alcohol. 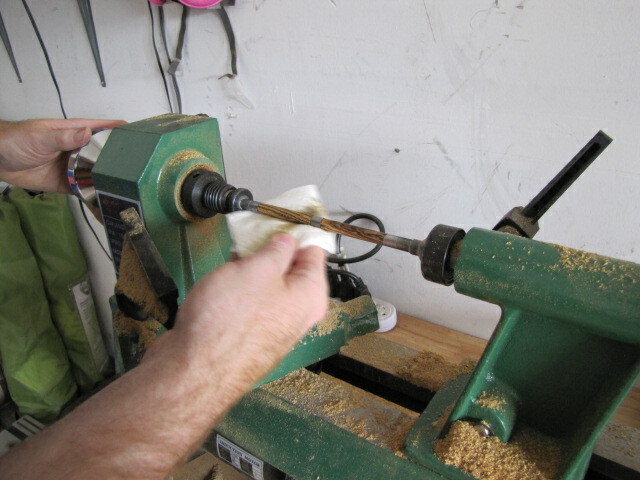 Just put a little on a folded paper towel and wipe back and forth across your blanks/bushings while turning the lathe by hand. You can use any kind of paper towel here – it’s not essential that you use high quality paper towels for this particular step. 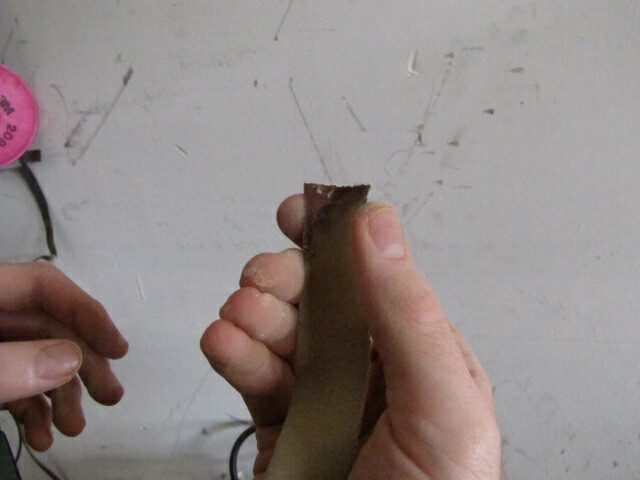 Remember – clean your bushings too. You don’t want any of that filth getting caught up in your finish. 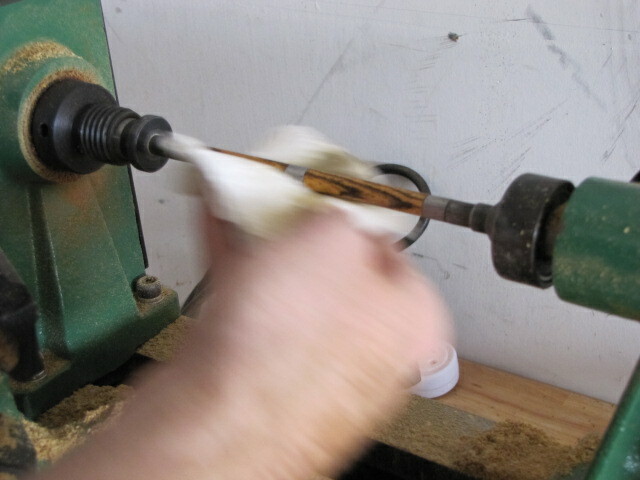 Let the blanks sit for 1-2 minutes so they’re completely dry and then move onto finishing your pen blanks!